The BBC science fiction series Doctor Who is no stranger to controversy and general media attention. From its beginnings in the 1960s through to the 1980s, it has been called too scary - apparently causing people to watch from behind the sofa - or too silly. More recently it has been accused of being overly politically correct, particularly with the casting of a woman in the title role. All of which sometimes overshadows the technical merits of the show, which in the most recent series included a more filmic look and the use of multiple radio microphones for the expanded main cast. From its debut in 1963, Doctor Who relied on technology to realise the adventures of the titular alien - a Time Lord - who can travel through time and space in a craft known as the TARDIS (Time and Relative Dimensions in Space). While some of the effects - both physical and visual - look shaky by today's standards, they pushed the boundaries of the technology available at the time. Likewise with the sound: Doctor Who was probably an introduction to electronic music for a generation of people, back in the days before synthesisers as we know them today became commonplace. The original show was eventually cancelled in 1989 - bringing to an end the era now known as 'Classic Who' - leaving diehard fans with only video releases of old episodes and a poorly received 1996 TV movie to feed their addiction. A much more successful revival came in 2005. 'NuWho', as it is known, maintained many elements of the original serials - including such villains and monsters as The Master (a rogue Time Lord), the Cybermen and, most deadly of all, the Daleks - but presented the stories with modern cinematography and CGI effects. The sound side dispensed with electronic music in favour of orchestral scores but brought in 5.1 surround sound for a more encompassing effect. As with most drama production today, the shoots use both boom microphones and wireless systems to ensure that as much of the on-set and location dialogue is captured and can be used for the final dub. This basic approach did not change for Series 11, broadcast at the end of 2018 with a special New Year's Day episode, Resolution (due for DVD release in February), on 1 January replacing the now traditional Christmas Day outing. Part of the reason Doctor Who has run for so long is the central conceit of the Time Lord being able to regenerate, allowing for a new actor to take over the role when the incumbent decides to leave. After much speculation the 12th Doctor (played by Peter Capaldi) regenerated into the character's first female incarnation (Jodie Whittaker) in 2017. The 11th series began shooting early in 2018. As well as Whittaker and new show runner Chris Chibnall, another change was the announcement of three companions who would travel with the Doctor. While this was not unprecedented - a trio of friends appeared with both the First and Fifth Doctors (William Hartnell and Peter Davison respectively) - it was in the days before radio mics were used routinely for TV production. Which called for a new approach from location sound mixer Deian Humphreys. Since joining the Who team in 2012, when Matt Smith was the Eleventh Doctor, Humphreys had used the basic set-up of two booms and eight radio mics to record every actor in a scene who has lines. This was made possible by using a Sound Devices 788 recorder, which enabled Humphreys to mix eight microphones and have ISOs in addition. "It's always been a two camera show so I would put radios on every speaking actor," he says. On receiving the scripts for Series 11, Humphreys saw that the core cast had grown significantly. "The biggest change was the Doctor having three companions," he comments, "which, with the characters they bump into [in each story] meant the track count was getting bigger and I would need more ISOs." The need for additional ISO tracks was partly because the mics Humphreys uses for his two booms each have two-channel outputs. The Schoeps SuperCMIT shotgun mic features a SuperCMIT feed on Channel 1, which is processed, and an unprocessed CMIT signal on Channel 2. Because Humphreys records both, a single mic occupies two ISOs. "That meant the four main characters took up eight channels before they meet anyone else," he observes. Humphreys says he is "a big fan" of Sound Devices equipment and spoke to the company's backroom technical staff about his dilemma. "I said I needed at least 16 inputs and the support team suggested the way round the problem was to use another 788," he explains. "So now one recorder is solely for radio mics and feeds into a second 788 for the booms, plant mics and other inputs, which works well." 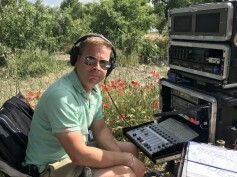 During recording for Series 11 Humphreys used tenAudio Ltd 2040 transmitters connected to Sanken COS-11 microphone capsules. While the intention is to capture the majority of dialogue through the boom mics, which were operated by Tam Shoring and Chris Goding, Humphreys says the wireless units provide backup and security: "The radios are safety blankets and they will save you if there are any horrible noises from smoke or wind machines and flame bars." Different sound recordists have different approaches to their jobs but Humphreys is very clear about his role: "My job title is production mixer, so I mix. I use a Sound Devices console connected by USB to the recorder, although it's only a control surface. If I'm mixing the booms I can't physically mix eight radio mics as well, which is where the 788 Mix Assist feature comes in. The algorithm will recognise who is speaking and close other mics, which means the output I get into the main recorder is a mixed output of the radio mics." In his microphone selections Humphreys goes for models that reject or minimise as much background noise as possible. As well as Schoeps SuperCMITs, he has also used the same company's CMC 6 mic amplifier with the CK41 capsule or the CCM 41 supercardioid. Despite some hostile responses from fans and mixed critical reviews, Jodie Whittaker's Doctor will be back for more adventures, albeit not until 2020. Shooting for Series 12 has already started, with Deian Humphreys again at his location recording trolley. He says the basic set-up will remain the same, although he is considering getting some of the new Audio Ltd A10 digital wireless units as the production progresses. The big change is the choice of capsule for the Doctor herself. Instead of the COS-11 Humphreys is trying the recently released DPA d:screet 6060 subminiature capsule. "I have always been a big fan of DPA lavalier mics," he says. "In my opinion they are the closest sounding lavalier you’ll get to a boom. However, up until now they haven't been the easiest to hide due to their larger profile. This is something the 6000 series has addressed." Humphreys adds that durability has also been a consideration: "When you hand over your mic and transmitter to an actor, in most cases they will not treat it kindly. I was forever sending my DPAs away for repair. But I am assured now that they are tougher and stronger in that respect. For these reasons I have primarily used Sanken COS-11s and found them to be reliable and easy to hide. The 6060 might surely be a strong contender but I'm not selling the 15 COS-11s I have yet." As for rough handling by actors, Humphreys has no concerns on his current production. "Jodie, who plays the Doctor, is fabulous at looking after her own miking," he comments. "She'll be given the mic and transmitter first thing in the working day and positions the mic [in her clothing] with a Rycote Stickie and Overcover. It works brilliantly. We’ll be encouraging her to do the same with the 6060 - unless her costume has changed dramatically!"